Abstract: What happens to your paper when you submit it to an academic journal? Who decides? What do editors do anyway? Can you increase your chances of getting accepted? Seamus Hegarty has long experience of writing, editing and publishing. He will share his insights into the publishing process and explain how editorial decisions are taken. This will give some Dos and Don’ts for successful publishing and maybe help you share your research findings with a wider audience. 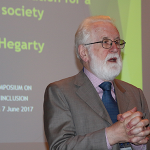 Seamus Hegarty has published numerous books, research reports and journal articles. He has edited the European Journal of Special Needs Education since founding it 34 years ago. He edited Educational Research for 21 years and has served on editorial/advisory panels for numerous other international journals. He has advised on research strategy and reviewed research proposal and reports for research bodies and universities around the globe. As Chair of the IEA’s Publications and Editorial Committee, he is responsible for quality assurance of IEA publications.